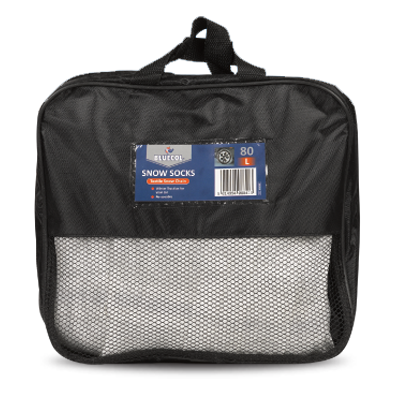 Bluecol Snow Socks are an easy fit high quality textile snow chain which when fitted to the driving wheels of the vehicle will provide much needed grip on snow and ice. Bluecol Snow Socks are ideal for emergency situations and short term are more effective than winter tyres and snow chains (a lot cheaper too). The Sock is held in position by an elasticated band around the back & front of the tyre and heavy duty straps across the face of the wheels. 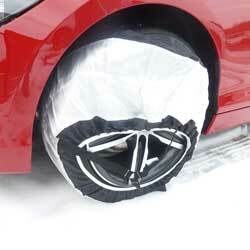 Bluecol Snow Socks are very quick and easy to fit, simply pull the sock over the tyre, roll the vehicle so that the tyre turns 180Â° and pull the sock over the remainder of the tyre. The Socks are re-useable and easily stored away in your boot. 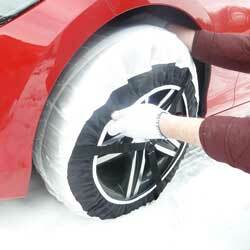 The heavy duty pack consists of 2x Snow Socks, a pair of fabric fitting gloves and mounting instructions. 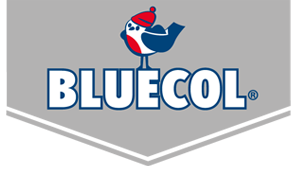 Bluecol Snow Socks are available in 5 different sizes. Each size uses a different part number and each part number is suitable for multiple tyre sizes. To find the correct Snow Sock for your tyre size, simply locate the tyre size embossed on the wall of your tyre, then cross reference with our application guide on pack. Please note: Bluecol Snow Socks are for emergency use only on snow covered roads. Once clear of snow and ice, remove the sock to prevent considerable wear. It is important you do not drive over 20mph when the snow socks are fitted. To understand which snow sock you require read the number embossed on the wall of your tyre, and refer the Snow Socks Sizes & Guidelines below under Information. For a complete list of sizes for all tyres please view or download our full PDF guidelines. Ensure your hand brake is on. 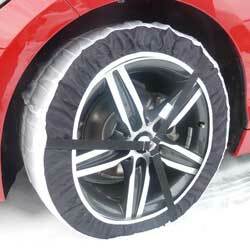 Bluecol Snow Socks should be fitted to the drive wheels only. Use the gloves supplied. 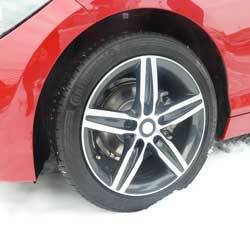 Starting at the top of the tyre, hook the elasticated rim around the back edge of the tyre. Pull the elasticated rim down the left and right side of the tyre. Rotate the wheels by 180 degrees so that the exposed tyre is now at the top. Pull the remainder of the elasticated rim around the back of the exposed tyre until it is completely on. 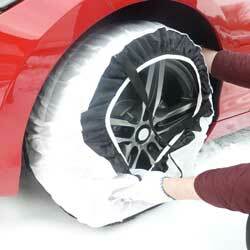 Ensure the snow sock is positioned centrally to ensure maximum grip.